Saturday January 25th 1893 We got the work done up and the turkey on in good time. Father, Mother, Ott & Fanny were ove for dinner. I worked on my lace what spare time I had. Will and I talked in the evening about what things we would leave here and what to sell. 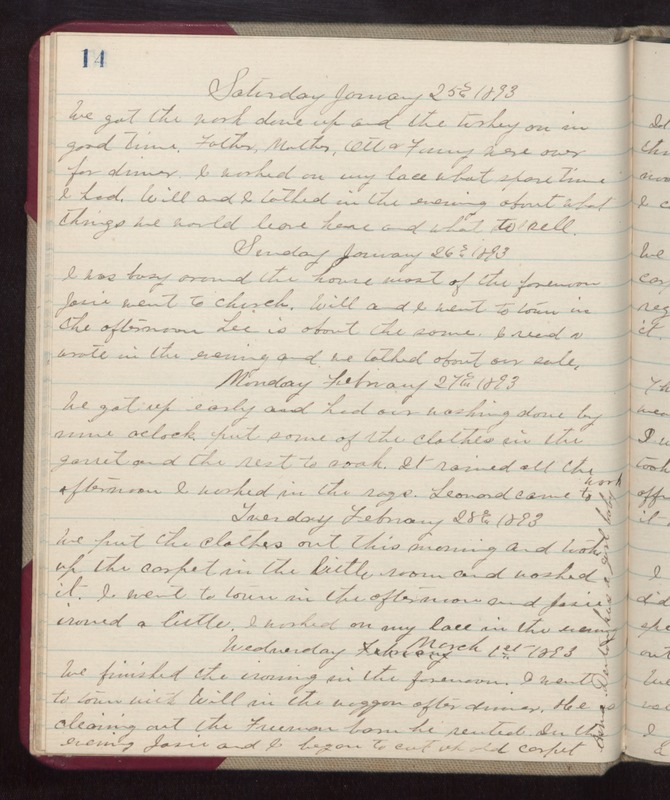 Sunday January 26th 1893 I was busy around the house most of the forenoon. Josie went to church. Will and I went to town in the afternoon. Lee is about the same. I read & wrote in the evening and we talked about our sale. Monday February 27th 1893 We got up early and had out washing done by nine oclock, put some of the clothes in the garret and the rest to soak. It rained all the afternoon. I worked in the rags. Leonard came to work. Tuesday February 28th 1893 We put the clothes out this morning and took up the carpet in the little room and washed it. I wet to town in the afternoon and Josie ironed a little. I worked on my lace in the evening. Wednesday March 1st 1893 We finished the ironing in the forenoon. I went to town with Will in the waggon after dinner. He is cleaning out the Freeman barn he rented. In the evening Josie and I began to cut up old carpet. Anna Denton has a girl baby.